Taking a deep view of the mountain, touching it with my imagination, carving the shape of the cliff and the valley with my fingers. The shadows of million trees was running alongside the car that took me through this mountain. The sky was blue and the clouds were white as they should be. The color of the ocean looked like a strange tinted spot in the horizon, when it showed between two mountains and slightly disappeared when we turned to the other side of this winding road. The road to Tana Toraja (Toraja). The magical dark green shadows of the trees with its own mystery, welcoming us just when we passed the border of Tana Toraja. I turned off the air conditioner and opened the window. The wind was cool, fresh with the aroma of woods, dance upon my face together with the warmth of the sun which slipped between the trees. What a beautiful day to start a new chapter of vacation with my two best friends, in the land, called Land of The Dead. Starting the journey from Palopo City, we had to drive around 1.5 to 2 hours to the downtown of Toraja. 1.5 hours full of God’s masterpiece view. Toraja can be reached by executive buses, directly from Makassar City (South Sulawesi – Indonesia) at cheap price starting IDR 140k (one way). The buses are equipped with comfortable big chairs, fully air conditioned, blankets and small pillows. Trust me 7 or 8-hour journey from Makassar to Toraja would comfortably spent. First stop was Batu Tumonga. 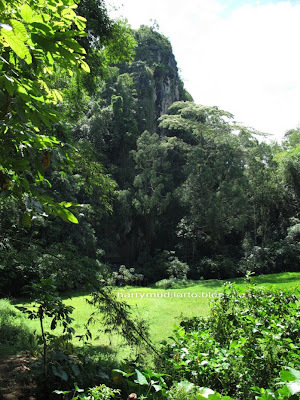 Batu Tumonga is a famous hill around Toraja area, which takes about 2 hours to reach the top (unfortunately, this winding road was in bad condition). We watched stunning view of cliffs and hills, terraced-rice fields, Tongkonan (traditional ethnic houses and traditional ethnic barns), and stone tombs (tomb inside a granite stone). Sometimes, the tomb is placed just on the side of the road, with broken door, and we could literally see the bones inside). The view from the top of the hill was so breathtaking, even when it was raining and the fog passed by. Well, we just sat inside the one and only hotel, having lunch, enjoyed our hot Arabica Toraja Coffee with couple of cigarettes, chatted and absorbed the beauty of what we're seeing. Room rate in Batu Tumonga starts from IDR 120k per room per night for two. We failed to visit the next place which we knew from a local guide of my other friend whom we met accidentally at Batu Tumonga. That place can only be reached by motorcycle, truck or 4WD car. Ah, so desperately wanted to see a massive granite stone which is holed for the tomb of hundreds of the dead. 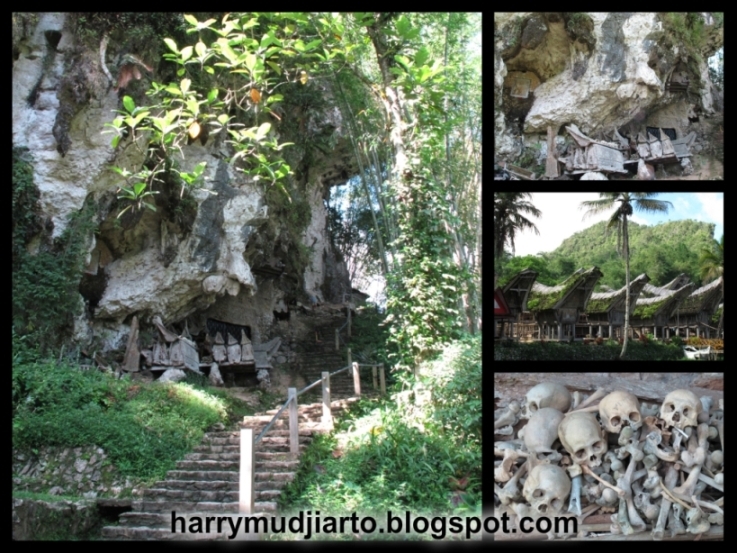 Nearby the Dead Stone, also can be found a giant tree which is holed for the tomb of many Toraja babies. 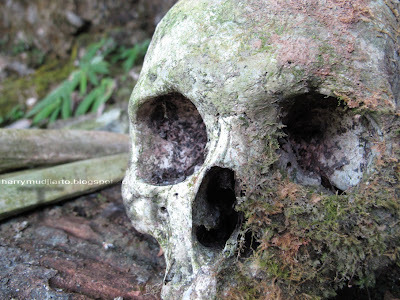 People of Toraja believe that a dead baby who has no teeth yet is pure off sin, so their dead body only needs to be placed inside the tree so their spirit will evaporate into the sky. Batu Tumonga checked and back to the downtown of Toraja for late lunch. 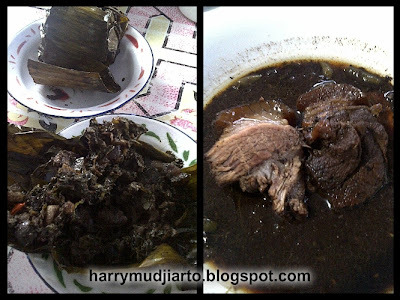 We decided to choose Piong (not kosher) for our lunch menu as one of Toraja signature dishes. Piong is a chopped pork belly and meat with some herb leafs, wrapped in banana leafs and steamed inside a bamboo’s rod. Piong has taste of savory with its own unique herb flavor, and for me the belly and the meat were a little bit tough. It was served with steamed rice and fresh chilli paste which was so extremely hot, awesome! 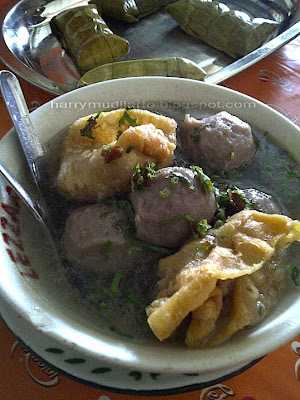 We also tried another signature dish of Toraja, called Pamarrasan which is boiled pork belly in black soup. Having checked out from Piong restaurant, we directly headed in to our hotel at Toraja Heritage Hotel (hotel) which is located around one and half kilometer from the downtown. Some say the hotel is the best hotel around Toraja area and the only one offers Tongkonan rooms, at only IDR 604.000,- for two (include buffet breakfast). Room rate in Toraja Heritage Hotel starts from (around) IDR 400.000,- to (around) IDR 600.000,-, meanwhile the extra bed rate is IDR 200.000,-. The hotel is completed with spa, fresh swimming pool and very good environment. The crew are so nice, friendly and helpful.The hotel also provides pick up service from (what local calls) Cow Statue (Patung Sapi) to hotel, if you arrive by public bus. The Tongkonan room is great with its own terrace and outdoor shower. The hotel has a quite beautiful garden with many birds freely live inside the area. We spent about one or two hour relaxing, enjoying the twilight and doing quick refreshment before heading back to downtown for dinner. 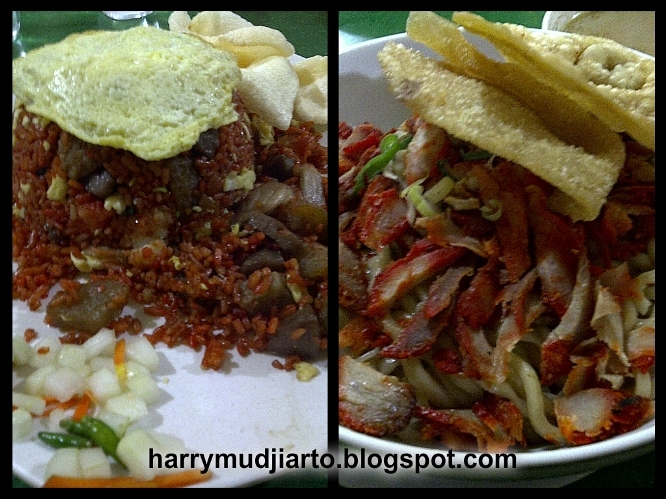 Our choice for a dinner venue was a restaurant which serves Makassar's signature dishes. We ordered Red Fried Rice and Wonton Noodle (both of these menu are not kosher) which were served in quite a big portion and tasty, for sure. My wish for visiting the traditional market after dinner didn’t happen, because the market closes at around 8 pm (daily) and we just stepped out from the restaurant at almost 9 pm. 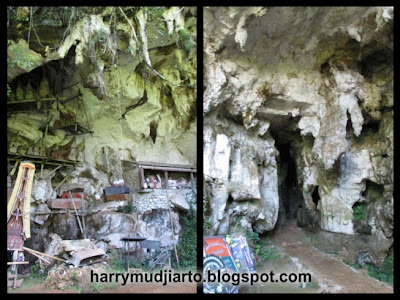 There were so limited (almost none) entertainment and cafés for spending your evening in Toraja except the hotel’s café. 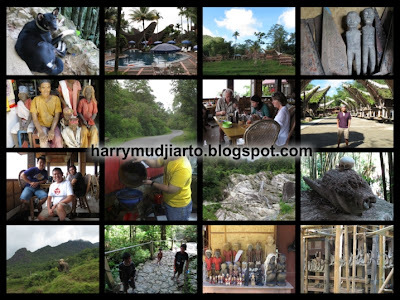 Our last and only option was going to some local shops selling Arabica Toraja Coffee (powder and seeds). The best quality of coffee powder is sold for IDR 40.000,- per quarter kilogram. The rest of day one evening in Toraja was spent at the hotel for chatting, drinking some local beers and smoking, oh yeah! Day two was started with lazy breakfast, checked out and drove to our first destination which was Ketekesu. 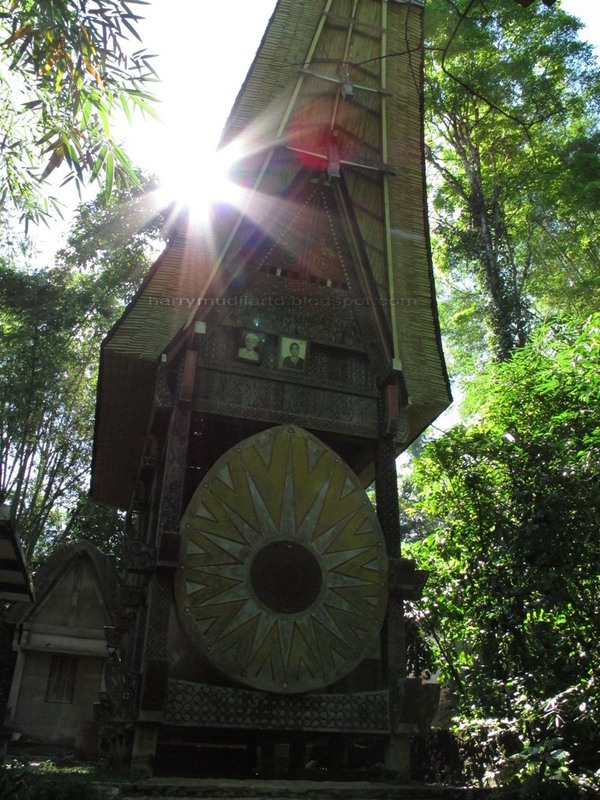 Ketekesu is one of two famous landmarks in Toraja area (alongside with Londa). Ketekesu is one of villages in Toraja which has traditional cemetery of Toraja people. The coffins of the dead are located on the stone cliff and for some rich or royal family, the coffin is put on the ground but with massive size (looks like a little house). Entering Ketekesu area, we could see dozen of Tongkonans which is ornamented with buffalo horns. The more buffalo horns attached above the front door of Tongkonan, the more prestige the family would get. Entering further inside the area, we watched couples of royal cemetery which looks like little houses standing on the ground. Some of them ornamented with tau-tau. Tau-tau is a wooden doll, replica of the dead and handmade with many terms and conditions applied, for instance: the family would sacrifice 24 buffalos. 24 buffalos? Well, we talk about a lot of money here, that’s why the buffalo horns placed above the front door would show how rich a family is. Some say one ordinary buffalo would cost around up to sixty million rupiah and one special buffalo (kerbau belang) would cost to three hundred million rupiah. Passing through the royal area, we finally reached the bottom of the Dead cliff. We watched many coffins hanging on the stone cliff, some has fallen from the stone cliff and stayed on the ground with the skulls and bones. Traditionally, there are two type of coffins, one is carved like buffalo for men and the other is carved like pig for women. When we walked further, we saw a small niche filled with many of tau-tau which is caged. It turns out that the cage is made for protecting tau-tau from theft and illegal collectors. It was said that tau-tau has been stolen for couple of time and once showed in Smithsonian Institution. The edge of the path in the cemetery was a small cave with glittery stone inside, it was fun to try coming into the cave with flashlight rented by local kiddos for only thousands rupiah. We used some locals (fluent in English) to guide us and tell the story behind anything in Ketekesu for only couple of thousands rupiah. 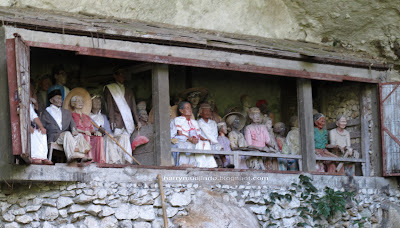 The best place to buy souvenirs is in Toraja Traditional Market. The launching price is lower than anywhere in Toraja Landmarks and yet you could still bargain. Moving from Ketekesu, next stop was Londa. 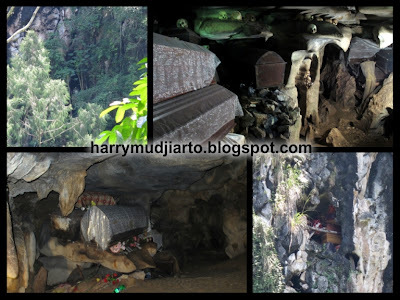 Londa is a similar place with Ketekesu, but majority of the coffins are placed inside the caves while some of the coffins hanging on the cliff. 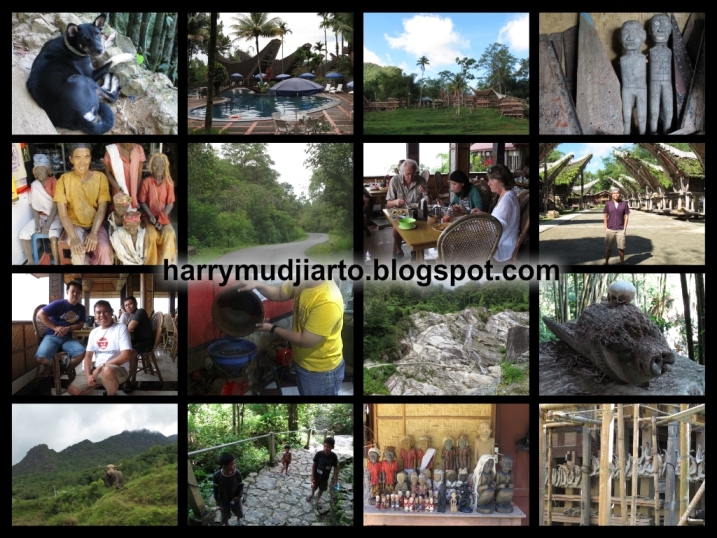 We were accompanied by a local guide who is also the owner of petromak lamp (Indonesia traditional lamp) that we rent. The cliff was about 90 meters high, having two caves in the bottom with tau-tau stage between them and rice field as its terrace. We could get tau-tau picture here better than in Ketekesu, because in Londa the stage of tau-tau are unprotected by cage or else, even the stage is located couples meter high from the ground. Two caves that we explored were filled with coffins, skulls and bones, some were from ancient era and some were just new from couple months ago. In Londa, we could watch the evidence of Romeo Juliet story did happen in real life. 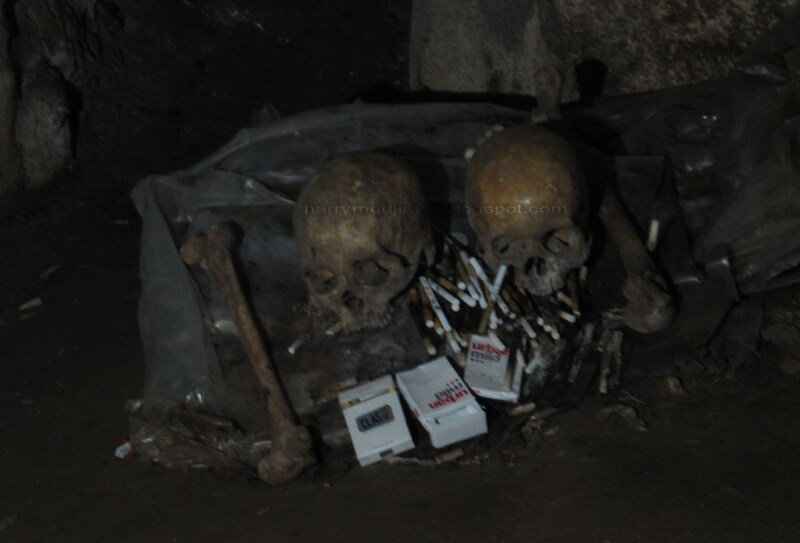 There are two skulls stand before the bones which belongs to a couple who died of suicide as their decision to end their forbidden love story. In Londa we could watch coffin placed in a niche up around 80 meters high from the ground in the cliff. The tour guide costing around couples thousand rupiah meanwhile we had to pay for petromak lamp for IDR 25.000,- per small group. Moslem should be extra careful when they choose the menu or restaurant, but yes we saw many kosher restaurants having banner in front of the restaurants saying “HALAL” (means kosher). Back on the road again with my two best buddies and waved to Toraja. So long Toraja, and hello again Palopo, the city in the arms of the mountains and guarded by the sea. Thanks to Heritage Hotel crew for the hospitality! 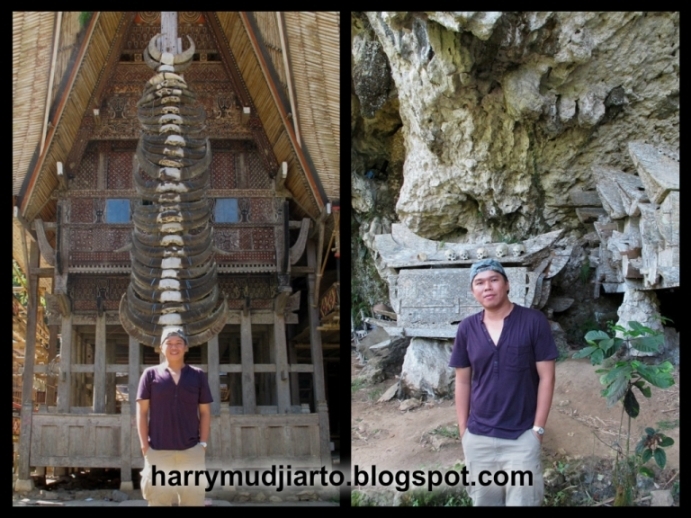 Thanks to Toraja people, you guys so friendly and welcome! Thanks to my 2 buddies for being such great travel mates!